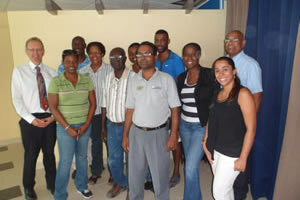 On Saturday 19 October 2013, managers from Sonesta Resorts, St Maarten in the Caribbean met at the Sonesta Great Bay Beach Resort for a briefing from Richard Teare. General Manager Karl Bourne is leading the Sonesta with GULL initiative that initially involves some 40 participants. Sonesta is the only all-inclusive resort company in St Maarten and has two properties and more than 700 guest rooms. On Monday 21 October, Mark Maloney, Division President, Eurest Dining Services USA, convened a meeting of his senior colleagues in Newark, New Jersey to design an innovative development program for his hourly team associates. This exciting new initiative starts in January, 2014. (Above right) Eurest senior leaders Bill Daley and Mark Gleason with Mark Maloney (Division President) Stephanie Maloney and Richard Teare. Eurest is part of Compass Group, a global food service company. Jamaica has led the way in the Caribbean region since 2009 with a range of GULL service industry applications. 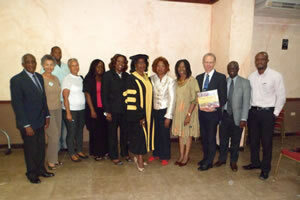 On Wednesday 23 October 2013 the current open group of GULL participants facilitated by National President, Norma Taylor, met in Montego Bay to celebrate recent attainments and in particular, the completion of Viviene Deokoro’s Doctor of Professional Studies degree. Viviene is a teacher by profession and she presented her GULL work at the 20th Biennial Conference of the World Council for Gifted and Talented Children held in Louisville, Kentucky in August, 2013. (Above left) The GULL Jamaica open group. Richard Teare is pictured Holding a copy of ‘Sweet Runnings’ a Jamaican Cookbook written by GULL graduate Pamella Powell. (Above right) Eduardo Smith assumed the honorary leadership role for GULL in North & Latin America on 26 October. 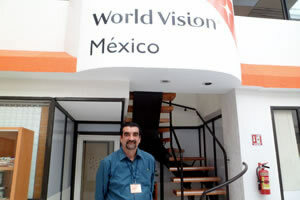 Eduardo is pictured at the World Vision Mexico with GULL graduation event held on 25 October in Mexico City. 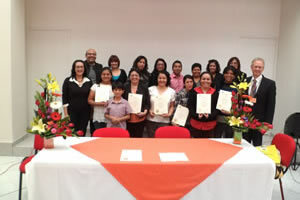 Inspired by the remarkable attainments of a group of its community volunteers in Tijuana, Mexico during 2011-12, A group of World Vision Mexico staff began their own GULL journey and met for a mid-point recognition event at the national office on 25 October. Richard Teare presented the certificates. The group is led by the national Director of Operations, Carmen Pérez Gutiérrez and facilitated by Patricia Hartasanchez, Life Skills Education Advisor, World Vision Latin America. The group are planning to cascade the GULL system to volunteers across the country. World Vision Mexico is currently operating in more than 300 communities across nine states and supports 60,000 sponsored children plus hundreds of thousands of community members. World Vision has been active in Lebanon since 1975 when it began to provide shelter, food, and medicine for people affected by civil and regional conflicts. In the 1980s, World Vision Lebanon initiated its development work among various communities mainly through institutional projects and in 2013, with GULL. (Above left) World Vision Lebanon volunteers at the mid-point event. (Above right) Young adults from Christian and Muslim communities in Lebanon’s troubled Northern region perform a song about peace, tolerance and reconciliation. 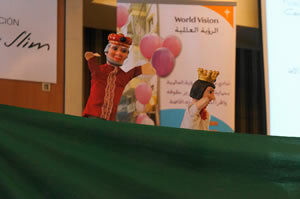 (Above left) World Vision Lebanon volunteers perform their own play about the importance of lifelong learning. 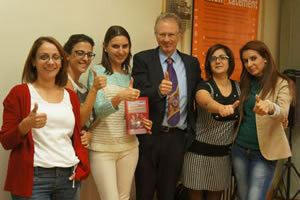 (Above right) The World Vision Lebanon with GULL lead team (from left to right) Corinne Sakr, Rita Chalhoub, Zeinab Karout, Richard Teare, Norma Wakim (team leader) and Elissa El Hassrouny. In Sri Lanka, World Vision Lanka has integrated GULL with a train the trainer development process called ‘Learning for Transformation’ (LfT). This provides a system for learning, reflection and improvement and a chance to be recognized for making changes. LfT author Nigel Goddard believes that this combination provides a practical and attainable response to the unfilled dreams of large numbers of people. 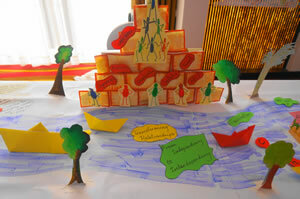 LfT training spans five modules, aspects of which are illustrated (left) and (right) in a depiction of the ‘river of life’ – one of the LfT tools. LfT is based on five concepts: Welfare, Development, Liberation, Liberal reformation and Transformational development. Module 1 introduces the five key concepts and Modules 2 and 3 focus on developing reflection and facilitation skills. 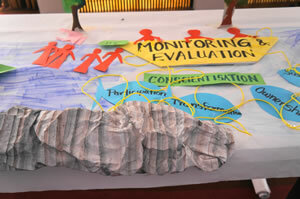 Modules 4 and 5 cover aspects of monitoring and evaluation and the tools needed to review progress as the LfT with GULL process cascades to communities. ‘Today some of our dreams have been translated into a reality. Our dream was to better equip our field staff, to provide meaningful facilitator training with effective engagement and to facilitate holistic transformation in the communities we serve. 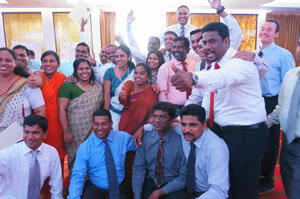 (Above left) World Vision Lanka’s LfT facilitators celebrate. (Above right) LfT with GULL professional Master pathway level 3 Diploma recipients at the mid-point recognition event in Sri Lanka on Friday 15 November 13. In 2007, the South Asian Academy for Good Governance (SAAGG) was established in Anuradhapura, the ancient capital of Sri Lanka. In 2010, SAAGG affiliated with GULL to provide a continuing development pathway for holders of its proficiency proved honorary awards. The annual award ceremony – attended by more than 600 people from every part of the country - took place on Sunday 17 November, 2013. The event was hosted by community organization Samadeepa Samaja Kendraya, and its community policing sponsor, the Asia Foundation together with the Peoples Assembly of Sri Lanka. (Above left) The colourful procession at the start of the annual graduation event. (Above right) The Ven. 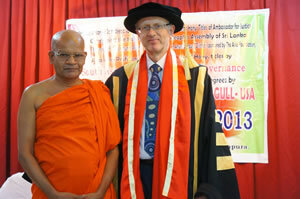 Professor Karagaswewe Wimalananda Nayake Thero, GULL Pro Chancellor for Sri Lanka and former Vice Chancellor of the Buddhist University, Anuradhapura, Sri Lanka with Richard Teare. A feature of the annual SAAGG with GULL event is the participation of all the main religious and most ethnic groups in Sri Lanka. The event opens with prayers led by each faith group in turn. 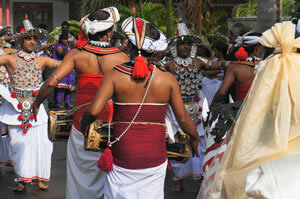 This year’s event also included – for the first time – Tamil participants from the northern city of Jaffna. (Above right) Participants from the Tamil community, Northern city of Jaffna. Some of the participants on the front row are wearing traditional costumes. On Saturday 30 November staff and volunteers working with Compassion Kenya, Tearfund Kenya and World Vision Kenya gathered in the capital, Nairobi for the annual GULL graduation event. Many of the participants had travelled long distances to participate. 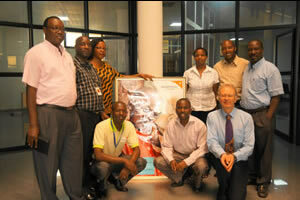 (Above left) Richard Teare pictured with a group of World Vision Kenya volunteers from West Pokot county (located on the Kenyan border with Uganda). They had travelled for more than 10 hours to attend the event. 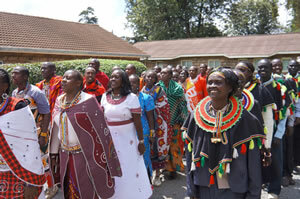 The group are pictured in their ceremonial dress and they later performed several traditional songs and dances. (Above right) The colourful graduation procession was led by World Vision volunteer groups from the Maasai region of Narok, located in the Great Rift Valley in the South West of Kenya and by the group from West Pokot. All GULL participants work on their own personal development as well as technical projects implemented by the supporting organizations – Compassion Kenya, Tearfund Kenya and World Vision Kenya. The technical work is primarily linked to enabling communities to attain greater self-reliance. A number of staff from the supporting organizations also received GULL awards – including professional doctorates for Godwin Kimaro, Regional Finance Director, World Vision East Africa Region and Obadiah Kisang, Regional Manager, Eastern Region, World Vision Kenya. (Above left) Maasai participants in their traditional dress pictured with their GULL certificates. (Above right) Richard Teare (left) Godwin Kimaro (centre) and Sarone Ole Sena (right), GULL’s Pro Chancellor for East Africa celebrate the completion of Godwin’s professional doctorate. Tearfund Rwanda & Burundi is refining its methodology for community development in consultation with its partners who in turn, work with local churches to mobilize communities. Prior to this, best practice had been identified, especially in relation to peace-building and accelerated implementation. As a next step, the GULL system is being used to enable the lead team to address gaps in provision and to embed self-directed action learning in its approach to community partnerships and on-going country-wide development. GULL is ideally suited to this challenge as it provides a low cost system in support of evidence-based learning, recognition, certification and community-led impact tracking. (Above) The Tearfund Rwanda & Burundi lead team pictured with Richard Teare at the GULL briefing and start-up workshop in Kigali, Rwanda on Monday 2 December, 2013. Burundi is one of the poorest countries in the world with one of the lowest per capita GDPs. In this context, World Vision Burundi is piloting the integration of the GULL system with its on-going projects and programming so as to facilitate staff development and capacity building in selected partner communities. (Above) The World Vision Burundi lead team with Richard Teare at the GULL briefing and start-up, Bujumbura, Burundi on Friday 6 December, 2013. Since its inception in October 2003, SNE Marketing Sdn Bhd has achieved significant growth and success in South East Asia’s network marketing industry. Based in Malaysia, SNE represents a wide range of products in services and manufacturing with operations in Indonesia, Malaysia, Singapore and Thailand. 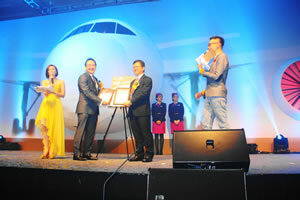 GULL’s work in South East Asia is led by Vincent Tang and he is working with numerous companies in the region. Given GULL’s profile, SNE decided to set-up SNE Academy in collaboration with GULL to provide more comprehensive training for its staff and associates. (Above left) Vincent Tang (second left) pictured at the launch of the SNE Academy, Malaysia, 7 December, 2013. (Above right) The SNE-GULL collaboration will enable the SNE Academy to integrate its training with action learning and professional certification. Welcome to Sarone Ole Sena (pictured left) GULL’s honorary Pro Chancellor for East Africa. Professor Ole Sena graduated from the University of Nairobi, Kenya and undertook graduate studies at the University of Cambridge, UK, McMaster University, Canada and then at McGill University, Canada. Sarone is a senior leader and among others, he led the ‘University goes to the village’ initiative in Kenya to encourage and recognize practical forms of professional development. 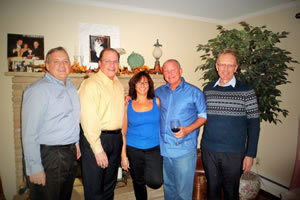 (Right) Welcome to Eduardo Smith, GULL’s honorary leader for North & Latin America. Eduardo trained as an oceanographer and in addition to marine sciences, he has worked in adult education in Mexico (where he was a state director for adult literacy) and in the field of solar energy. As 2013 draws to a close, I should like to thank GULL’s team of honorary officers, participants and supporters for their work and support this year. Wishing you a peaceful Christmas and New Year.